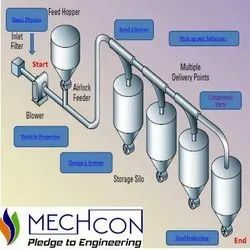 Mechcon has know-how, experience and technology for advanced powder and granular handling solutions and sources high quality components to configure the best conveying system for the food, dairy, pharmaceutical and chemical industries. Our systems weigh all ingredients in a recipe to the nearest gramme then forward them for further processing – an entirely automatic process right from delivery of raw materials. Quality is our highest priority at all times. All machines are easy to clean and comply with all current hygiene specifications. Technology - External / internal silos, tanks, containers & container systems, protective suction / pressure delivery systems, screening systems, filling stations for bags and big bags, loading stations for bags, big bags and drums, suction weighing systems. Product quality occupies first place in this sensitive segment. We achieve consistent composition through ultra- - precision weighing and precise metering in fully - automatic production lines. Flexibility, speed and precision are key factors in the automatic delivery of chemical substances for achieving consistently high quality, absolute compliance with the recipe. Automatic, dust - free delivery of all raw materials such as resins, fillers and additives creates a set of humane, ergonomic working conditions for the operator. Our systems are able to sustain high standards of metering and weighing precision even when contending with large batches and high throughput rates. Technology - External / internal silos, loading station for bags, big bags, filling stations for bags and big bags, Special closed big bag emptying systems, containers & container systems, drums, suction weighing systems etc. Lean or dilute phase pressure conveying systems one of the most common conveying methods used for powders and granules, such as sugar or flour. The system uses positive displacement blowers - providing air at up to 1 Bar (g) - to convey materials through a pipeline to a destination where the air and product are separated by a filter. Ideal for materials that are smooth and robust with a light bulk density. Commonly used for dosing and continuous weighing systems. A wide range of convey rates and distances that can be tailored to the materials being delivered. Stepped lines to reduce terminal velocities, abrasion and degradation. Dense Phase Pressure Conveying Systems generally use compressed air in between 1 Bar (g) to push materials through a conveying line to its destination where the air and product are separated. The product extrudes through the pipeline, initially at a low velocity, and gradually accelerates towards the destination. Close the discharge valve and refill the vessel. A panel of supplementary air valves and sensors with correct fluidization is used to control the air pressure in the pipe and the velocity of the material at intervals throughout the system to ensure the smooth conveying of the material. This also allows the flow of the material to be stopped and started again with relative ease. The ability to convey materials from a single point to multiple destinations. Polished designs as per FDA standards with ease of cleaning facility. Lean Phase Vacuum Conveying systems mainly use exhausters that provide up to a 50% vacuum to deliver the material through a conveying line to receiving vessel where the air and product are filtered and separated. For lower capacity, Fans may also be used as the base force. The fans or positive displacement exhausters are activated, causing a vacuum to be formed in the system. Material is fed into the system; with a rotary valve airlock (or screw feeder) if metering or dosing is required. The material is carried by the vacuum and delivered to a receiving vessel. Filters then extract the material from the air and the product is then transported to its destination. A low to moderate conveying rate and distance, usually at a short distance with low capacity. Suitability for conveying materials which tend to pack or compress under pressure. Reduces dust hazard in the unlikely event of a system leak. Allows material to be weighed and dosed if required. Ability to convey materials from multiple sites to a single location. This method is frequently used for central vacuum cleaning systems or to draw product from multiple silos and other applications that require a reticulated network of vacuum pipes to convey product to a single collection point. Such as wood shavings or fibre material, as well as toxic materials which are hazardous in the workplace. 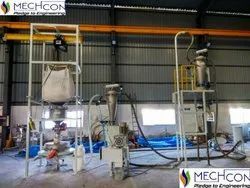 The PTS – Powder Transfer System offered by Mechcon Technologies is an exceptionally effective and reliable method of transferring and dispensing both dry and wet powders and granules. Its unique filtration concept with a flat membrane and cartridge membrane makes it the only vacuum dense-phase system suitable for large number of powders. Creation of electrostatic charges is strongly reduced as hos is statistically earthen. It’s a solution for mobile convening. Cyclone filling, up to the level sensor or till the predetermined time.